In the first part of this Market Insight series (EA 12-May-17), we explored the changing competitive landscape amongst contaminated land consulting practices and the impact of M&A, the fierce competition for skilled practitioners and the changes brought about government funding cuts. In the second installment, we focus on the potential ramifications of the shifting political scene and notably Brexit, as well as emerging opportunities both in the UK and internationally. Streamlining the planning process is something the government and its agencies are focused on promoting, chiefly to address the shortfall in housing in the UK with the current supply at best meeting half the 232,000 new homes needed annually. The government has set quite ambitious targets, including building one million new homes by 2020 and having planning in principle on 90% of the brownfield sites on local authority registers. It has recently released its housing white paper which included proposed changes to the national planning and policy framework (NPPF), which could have implications for the sector if the Conservatives remain in office after the snap general election next month. He goes on to acknowledge that while the paper raises awareness of the problems surrounding starter homes, “it remains difficult to see how a universal solution is going to come from it”. The result of the election in a few weeks’ time has the potential to radically alter the business environment for these firms – the manifestos from ache of the political parties released this week provide an insight into what may be in store. The Labour Party is promising to build over one million new homes (EA 17-May-17), although they don’t give a timescale, while the Liberal Democrats pledge is provide 300,000 per year up to 2022 (EA 19-May-17). Meanwhile, the Conservative manifesto commits to delivering a further half a million homes by the end of 2022, on top of the one million promised by the end of 2020 (EA 19-May-17). At the same time, all three main parties have committed to big national infrastructure spends. However, there are even bigger political changes afoot, with the Brexit vote in June last year sending shockwaves through the economy and causing funding delays and uncertainties in the property development sector for a short period, impacting demand for site-related services. And now that the two-year process of exiting the EU is underway, Environment Analyst asked the contributors to this feature series what effects and impacts on their clients they have witnessed so far and what they believe may be still to come. Business unit lead for site characterisation and remediation at Golder Associates, Robert Noden, agrees with this assessment of the sector’s regulatory future post-Brexit: “Contaminated land regulations in the UK are very mature and I can’t see that changing, as the market is so used to working under them.” But he adds, “Something I could see changing, is the amount of manufacturing in the UK, which would lead to an increase in opportunities for our services”. Meanwhile, Cherry from OHES believes there is lots to remain positive about, stating: “Much environmental legislation in the UK is EU driven and which laws will be kept without the EU as a driving force is unclear, but any such changes will have a direct impact on the market I’m sure. It could go either way, becoming more stringent or more flexible, to give the market a boost. I wouldn’t like to put my hat on either one at the present time.” But he believes that “adaptability” is the best solution for consultancies to help clients through such uncertain times. China has been for many years now an exciting but daunting prospect for UK and international environmental consultancies looking to exploit pasture new (EA 22-Jan-14), where despite decades of highly-polluting industrial activity the assessment and remediation of contaminated sites has yet to become commonplace. AECOM for one made the strategic decision to target this fledgling market a few years ago (EA 20-May-13), with Robbie Dow – its remediation director for Europe, Middle East and Africa at that time – tellingEnvironment Analyst: “There is a lot of rezoning, leading to industrial facilities being moved away from residential areas in order to segregate manufacturing from where people live, meaning China is potentially a really strong market for contaminated land services”. Danish-based consultancy COWI asserts that it too is an active player in China’s land contamination and remediation sector, where it is targeting larger projects in particular, in reflection of its global strategy (EA 22-Mar-17) . The development of the Chinese market is set to receive a further boost with the implementation of a similar regulatory system to the UK’s ‘Part 2A’ of the Environmental Protection Act (otherwise known as the contaminated land regime), meaning as of July polluters in China will become responsible for any land contamination they have caused and its clean up. And prior to any development, remediation efforts must undergo a third party assessment, with failure to meet standards resulting in land use applications being declined. But he agrees with Thomas in that the deals the UK government strikes following Brexit will have a significant bearing on how easily this may be achieved. Furthermore he also envisages that more favourable deals with non-EU countries may lead to international firms from countries like Australia and the US increasingly moving into the UK market, making the domestic scene even more competitive. Golder Associates also has established foothold in China, boasting three offices across the country in Beijing, Guangzhou and Shanghai. With this presence, Noden explains the firm would be less likely to export services from the UK, unless at a client’s specific request, but having said that Golder’s UK team is involved in its Chinese projects on a case by case basis when certain technical expertise may be required to support the local offices. For many firms, the UK itself still offers some seductive emerging growth opportunities – including the flowback prone onshore fracking industry and as the wider maturing and presently price-constrained oil & gas industry looks towards decommissioning its assets. Cherry is positive about both of these areas, identifying fracking as “a definite future workstream for the contaminated land market as a whole.” He adds: “Although as an industry there are still a lot of unknowns, accidents do happen and then it’s a case of managing the risk – and ultimately it’s the same process regardless of the industry or contaminant.” But he also believes that OHES’s existing foothold in oil & gas due diligence work could make transitioning into the decommissioning market more feasible, stating: “We have always had a good background in that area. It is a possible work stream we would be very keen to look at”. A similar stance is taken by Golder, which Noden says will continue to focus on delivering onshore decommissioning projects having secured a number of land quality frameworks primarily in the O&G, nuclear and manufacturing sectors. “North Sea decommissioning is something we will look at, but firms need to have specific strengths in this area and as such it is not currently a key target for us at this time,” he tells Environment Analyst. But first and foremost he expects the main growth opportunities for Golder in this field to come large infrastructure projects and also favourable conditions in the manufacturing sector. Positively, Noden also notes that his firm – traditionally siloed in the natural resources sectors – is also now seeing “increasing work in the previously problematic mining industry”. 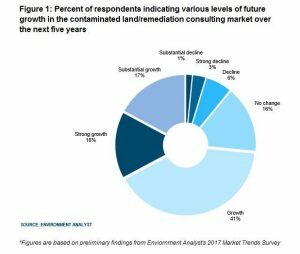 Initial research undertaken as part of Environment Analyst’s Market Trends Survey 2017 [which is still live and open for further responses] reveals that the vast majority of consultants active in this area remain positive about the five-year growth prospects for contaminated land services (see figure). Some 74% are predicting growth for these services, with 31% expecting strong or substantial growth (>5% per annum). Only 10% of those surveyed expect a decline. In terms of the sector’s prospects going forward, Moore remains confident that for WSP, “provided there are no major macro-economic shifts, there will be opportunities within utility and energy frameworks and a lot of work from large national projects, with opportunities for multiple organisations with contaminated land skills to collaborate.” He cites the work being carried out for HS2 and Crossrail as prime examples, whilst also noting progression in the construction property and industry markets, something which “we can see continuing”. 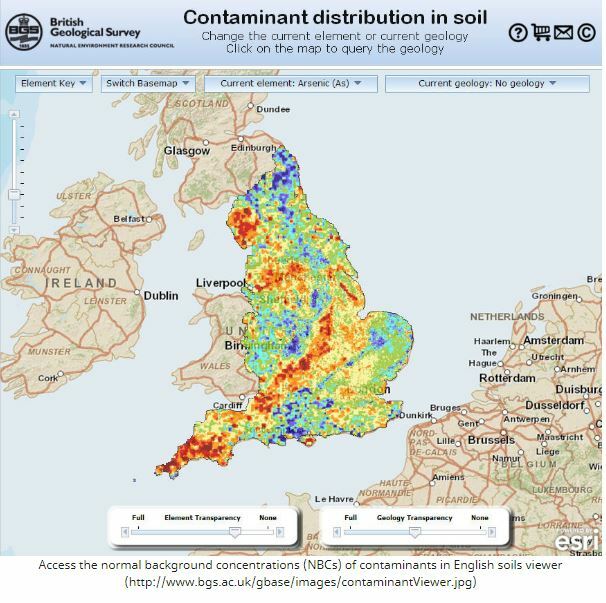 Chris Loaring says Landmark has responded to this trend by evolving its conveyancing searches to package together contaminated land, flood risk, energy, infrastructure and ground stability reports to better serve the growing demand amongst its clients for one-stop information on all of these risks. He believes focus is shifting away from the more mature and in a way “static” contaminated land area towards the more “dynamic, topical and growing” threat of flooding/climate change resilience. He also identifies environmental insurance as a potential growth area for the sector as a mechanism to reduce or transfer risk, as investors seek a solution to the potential threat of contaminated land liabilities posed by their real estate assets – although this has long been on the cards. This could spell good news for smaller specialist players such as OHES Environmental, a company initially established to respond to pollution incidents coming from insurance policies set up by its parent company, OAMPS, an insurance broker. Both Noden (Golder) and Moore (WSP) are adamant the future for the UK contaminated land market is extremely positive, describing it as “very buoyant” and “looking busy” respectively. Moore advises that consulting firms may need to “increase their technical skills to keep up with the market and to ensure progress”, while Cherry is focused on “implementing innovative and adaptable ways of working” to stand OHES in good stead moving forward. This article has been republished and first appeared at https://environment-analyst.com/56003/market-insight-trends-in-uk-contaminated-land-consulting-part-ii.